Commissioner and Director of School Education Anouced advertisment of Disitrict Institutes of Education and Training (DEECET) /Elementary Teacher Training Institutes Common Entrance Test (DIET CET) notification will be released 01-07-2015. Candidates can fill online application to take admission into two year Diploma in Education (D.Ed) in Government District Institutes of Education Training (DIETs) and Private Elementary Teacher Training Institutions in Telangana States. Students should have passed 10+2 qualification or its equivalent qualification. Students must have completed 17 years as on last date of application.No upper age limit. Students must have 45% aggregate.40% of marks in case of SC /ST/PWD students. The fee prescribed for appearing for DEECET (including examination fee) is Rs. 200/- (Rupees Two hundred only). Candidates can pay the fee through APONLINE / e-Seva centers or through Payment Gatewayand submit online application at the DEETCET website. 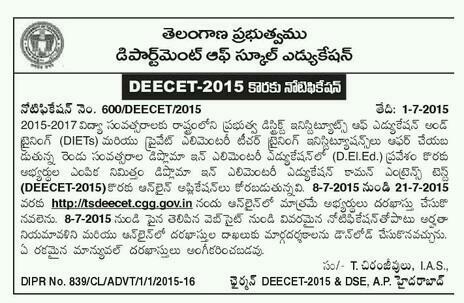 DEECET will be conducted in all the Districts of the State. The test will be conducted from 10.30 AM to 12.30 PM (2 hours). Date of DIETCET-2015 entrance exam DEECET(DIETCET) Will be Conducted on 9th August,2015. Submission of online Applicatipn9-7-2015 to 21-2015. Date of issue of HallTicket from 30-7-2015. Entrance Exam to b held on 9-8-2015. Date of Releasing Result 22-8-2015. Commencement of counseling 1 September 2015. Applicants must fill online application through official website of DEECET http://tsdeecet.cgg.gov.in. 1.Fill the application with required details in the blanks provided there. 2.You can also download information bulletin free of cost from the official website. 3.Detailed procedure how to apply/ fill the application is given in the Information Bulletin. 4.Don’t do any mistakes while filling online application,whatever we give data in the application. 5.DEECET 2015 hall tickets shall be dispatched with the same date. 6.Once the Hall ticket will be dispatched no edit or change of date will be allowed.